The Nintendo 3DS comes packaged with a set of AR (augmented reality) cards. Place a card in front of the camera and you can take part in a variety of minigames, using your environment as the play area. 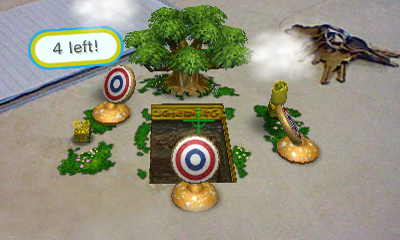 The Shooting minigame requires you to shoot targets before fighting a dragon. In AR Shot, you have to knock a ball into a hole over bumpy terrain. In Fishing, you have to try and catch as many different kinds of fish as you can. 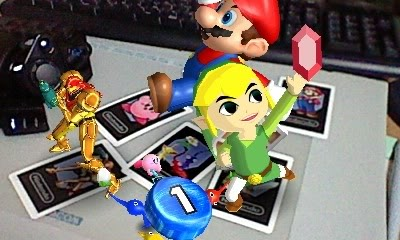 You can also use the AR Cards to pose Miis or other Nintendo characters and take photos. The basic card, displaying a question mark from the blocks in Super Mario Bros. This card is used for most of the AR Games, as well as displaying your Mii in Mii Snaps, and Mr. AR (the yellow box character) in Star Snaps. A card showing artwork of Mario. This card is used in Star Snaps to display a 3D model of Mario in 5 different poses (hand out, running, jumping, flying and sitting), each with accompanying sound effects. When Mario first appears, he is accompanied by the start of the Super Mario Bros. overworld theme. A card showing artwork of Young Link (aka. Toon Link) from The Legend of Zelda series. This card is used in Star Snaps to display a 3D model of Young Link in 5 different poses (fighting pose, running, rupee collect, sword slash, holding up a bomb), each with accompanying sound effects. When Link first appears, he is accompanies by the "Item Collect" fanfare from The Legend of Zelda series. A card showing artwork of Samus Aran from the Metroid series. 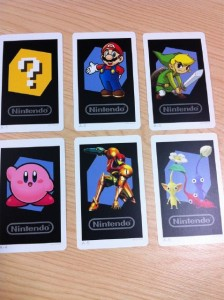 This card is used in Star Snaps to display a 3D model of Samus in 5 different poses (crouching, standing, blaster cocked, shooting, morph ball), each with accompanying sound effects. When Samus first appears, she is accompanied by the "Item Collect" fanfare from the Metroid series. A card showing artwork of Kirby from the Kirby series. This card is used in Star Snaps to display a 3D model of Kirby in 5 different poses (waving, drawing, riding a Warp Star, holding a Parasol, running), each with accompanying sound effects. When Kirby first appears, he is accompanied by the Stage Clear "Kirby Dance" music. A card showing artwork of the red, yellow and blue Pikmin from the Pikmin series. This card is used in Star Snaps to display a 3D model of the Pikmin in 5 different poses (standing/resting, running, carrying a pellet, buried, striking a pose), each with accompanying sound effects. When the Pikmin first appear, they shout out their name. Additionally, the music in Star Snaps features a short excerpt from the Super Mario Bros. theme mixed into it. 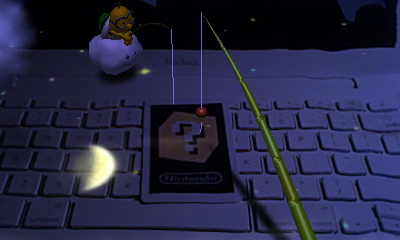 From time to time, Lakitu appears and starts fishing. If you let him catch something, it will be a Blooper. 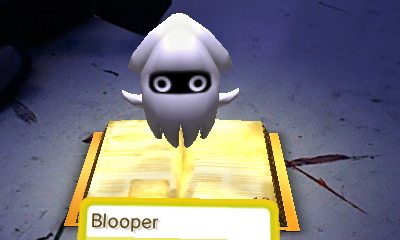 You can then also try and catch a Blooper. 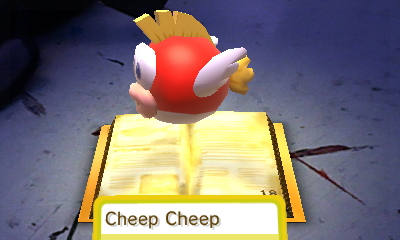 Place the AR Card on a red surface and you will be able to catch Cheep Cheeps, the red fish from the Mario games. 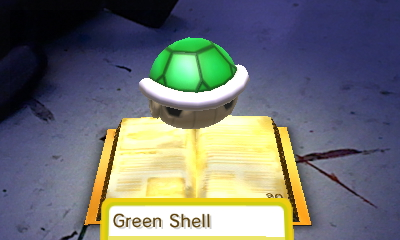 Place the AR Card on a green surface and Koopa Troopa shells will fall from the sky into the water. You can then catch one. 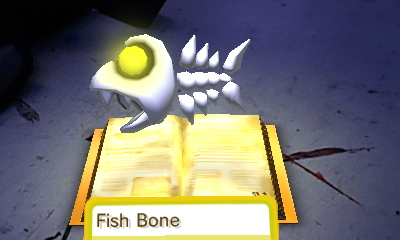 When lightning strikes the water, the fish all turn into Fishbone, the enemy originally from Super Mario World. The game provides stamps, including Pikmin and an 8-bit Mario from Super Mario Bros. When you draw with them, they make sound effects from their games. When selecting a pen you can choose some special effect pens, including a question-marked Mystery Pen. When you use this, stick men appear and make 8-bit style sound effects, including several from Super Mario Bros.
You can choose templates of all the star characters from the AR Cards: Mario, Young Link from The Legend of Zelda series, Samus Aran from the Metroid series, Kirby, Pikmin and Mr. AR. Artwork of them appears on the touch screen for you to trace.